A hearty Texas welcome to y’all! My name is Amy and I am a 30 year old ceramic artist/potter living and working in Texas, 40 miles east of Dallas. I currently work primarily in white earthenware fired to cone 04 in oxidation, though I do have a high fire kiln in slow progress. All pots are lined in food-safe glazes. They may be microwaved or placed in the dishwasher but their life would be prolonged by hand washing. My home is shared by a wonderful husband, Aaron, and two erstwhile stray kitties, Mau and Melvin. I’m also a proud mom of three Peruvian Paso horses, including a 20 year old mare who is the namesake of the studio. 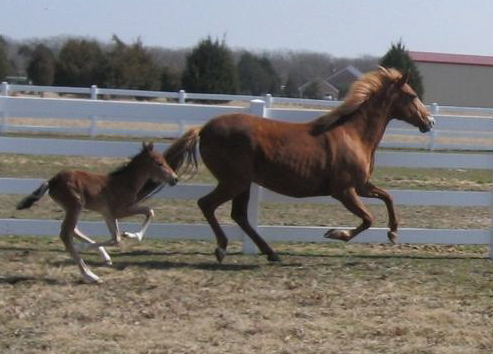 The studio namesake, JWF Azucena, with her foal ALM Fusilero, my currently 6 year old gelding.